Wedding in Paris, France by Gaby. Gaby photographed Marina and Yoann's wedding in Paris this April. 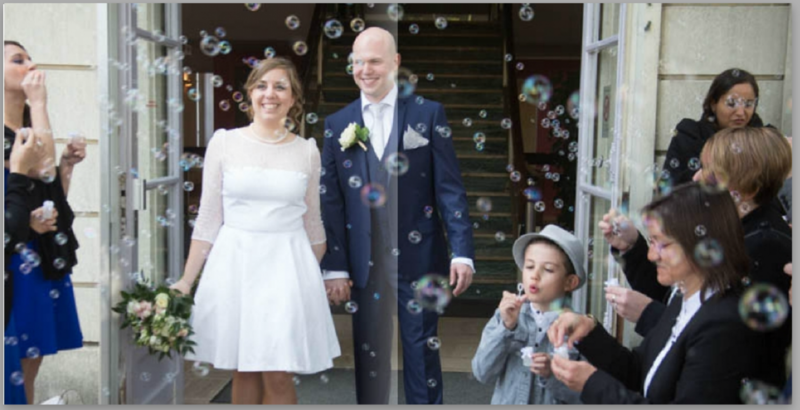 She used the photojournalism approach that is her specialty which the young couple loved, and combined with traditional portraiture which made the parents and grandparents happy to see everybody! The wedding preparations started at 9:00am. Gaby was actually photographing the setting the day before. They had both a civil and a religious ceremonies - 2 wedding dresses! The ceremonies were followed by a champagne reception and ended with a beautiful party which went all night long. By the time Gaby retired at 4:00am, the wedding party was still at it, dancing and singing! Are you interested in having your event or visit in Paris photographed? Gaby is available for weddings, corporate or social events, or just capture you in Paris while you're there. Please contact us for availability and pricing. Below is one of the spreads from the album.